UNITED NATIONS, December 26 -- What is UN Peacekeeping, and its Mission in Darfur in particular, doing? Are they unable, or simply unwilling, to provide basic information, including about the protection of civilians they are supposed to be engaged in? Spokesperson Nesirky: Which fighting are you referring to particularly? 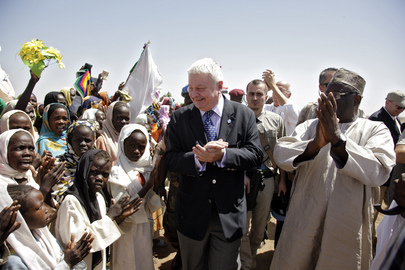 This presumably meant the UN's colleagues in Darfur -- that is, staff there under envoy Ibrahim Gambari. In Sudan, Saturday and Sunday are not the weekend, there is not too much Christmas. Still, three days after the question was asked, there had been no answer at all. Since the retaliation charge involved Ibrahim Gambari, Inner City Press also sent the question to Mr. Gambari. "your inquiry related to UNAMID has been sent to me. I am looking into it, but you will understand that it will take some time over this period to get information. I will not have an update for you today, but will make contact with you tomorrow." How can it be that on a simple question about bombing in an area where the UN and DPKO are spending $1 billion dollars, no answer has been possible in four days? Does DPKO not monitor or receive questions asked but not answer at the UN noon briefing, such as the now old question about DPKO intentional inaction in Abyei? To some it has come to appear that the spokesman for Ladsous is only that: a spokesman for a single reclusive bureaucrat -- Ladsous has been dodging stakeouts and press conferences since holding a single one in the months since he came in as the fourth Frenchman in a row to have the job, complete with baggage from Rwanda, Haiti and Ben Ali's Tunisia, all left unaddressed -- and not for the people of DPKO, who do much of the UN's work in the field. On the question of retaliation, after the shameful development of the case, what's one more day? Watch this site.